I reread one of my favorite books,The Phantom Tollbooth by Norton Juster, the other day. I love it because I always notice something new every time I read it. This time around it was the bells on the Soundkeeper’s dress — I should like to paperdoll her outfit now, but I’m not really in the mood to draw a million little bells tonight. As you see, I was in the mood for something much easier, which is the dress that Rhyme and Reason wear. Since they wear about the same thing, the dress can be for either of them. Make Sylvia Rhyme and Iris Reason, or the other way around, as you please. Don’t forget, I’m liveblogging (or as Eleanor has it, live-dolling) the Oscars this Sunday. 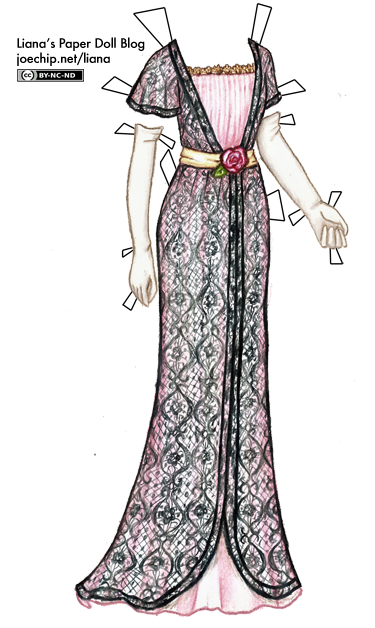 I figure that will consist of drawing red carpet dresses until my fingers drop off. To get everyone in an Oscar mood, let’s have an Oscar poll. Check out the oscar.com Costume Design nomination information if you need a refresher. Of course, for Halloween I must do a Masquerade dress, the first step of which was blithely breaking the “no research” rule once again. The movie dress was a pink concoction; I read somewhere it was supposed to represent the influence of the scarlet-garbed Phantom, but I personally didn’t think it quite worked that way — I thought it just looked too conventional, kind of like “Totally Ingenue Barbie!” although certainly it was very beautiful. 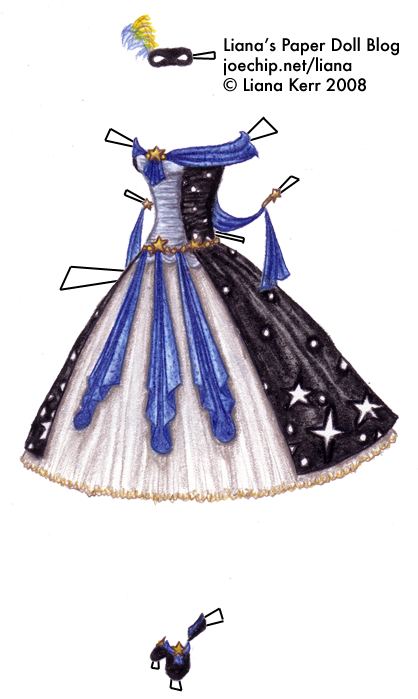 The stage outfit was rather more what I would prefer, for a masquerade ball — a blue and pink silver-starred ballet outfit, referred to as her “Star Princess” dress. Here you can see a picture of the costume design sketch, some images from the stage and a fan’s reproduction of the dress, and this forum post includes a discussion of the dress and links to pictures of it from different productions. I liked the shape, but didn’t want to just copy one of them, and so looked to the original text for further inspiration. Now, the thing I should have quite liked to paperdoll from the original text was the Phantom’s “immense red-velvet cloak, which trailed along the floor like a king’s train; and on this cloak was embroidered, in gold letters, which every one read and repeated aloud, ‘Don’t touch me! I am Red Death stalking abroad! '” But as for Christine, the only thing described is her black domino mask, and re-reading that scene, it is such a very dark time for her… So here she is, as my Star Princess for the masquerade, but not the stars giving way to dawn as on the stage; the night has laid claim to this Christine. Well, even if the book does promise to be melancholy, there is a silver lining: the dresses from the Belle Époque are beautiful, even if Sylvia isn’t quite the desired S-shape. I remember later on she wears some form of white dress, but there’s not a lot of physical description in the book so it’s based more on vintage gowns from 1904 and 1905 I’ve been looking at, particularly this one.